The annual report from the State Oceanic Administration on China’s rising sea levels brings no surprises and no cheer in equal measure. Sea levels continue to rise faster than the global average. By the middle of this century, they are forecast to be 145mm-200mm higher. That doesn’t sound much but is sufficient to flood 87,000 square kilometers (34,000 square miles) of lowlands, or about 10% of coastal provinces’ land area. More than 1,300 seaside townships, 2,000 kilometers of rail lines and 22,000 kilometers of roads are at risk of being underwater. The Bohai Sea and the adjacent southwestern side of the Yellow Sea. and the waters around Hainan are rising fastest. As we’ve noted before, urbanization, industrialization and overuse of groundwater is exacerbating the problem. Large cities are sinking because the water table below is sinking. too. All in all, coastal regions are left more vulnerable to the ravages of wind and rain. Typhoons affected more than 500 million people in southern China last year and caused more than 3.3. billion yuan ($520 million) of damage. In addition, river deltas such as the Yangtze’s and the Pearl’s will become more vulnerable to surges, salt tides and the salination of farmland and coastal forests. Short of dealing with climate change, there are few hard defences against rising sea levels. Soft natural defences and restricting development in the most vulnerable areas is, as the SOE recommends, the most prudent course. Despite heavy seasonal rains causing floods and havoc across southern China, the north and parts of the center of the country still face severe drought. Officials have warned that crops are at risk on the North China Plain between the Yellow and Huai rivers. More than 4 million people across eight provinces are short of drinking water. The lack of rain extends to the Korean peninsula across the Yellow Sea. The Associated Press reports that North Korea is facing its most extreme drought since records were first kept more than a century ago, threatening already tenuous food supplies. Nearly 5.5 million people are still suffering from lingering drought in Yunnan and Sichuan despite the recent rains bringing some relief. Authorities say that only 290,000 fewer people and 220,000 fewer livestock in the two provinces are short of water because of the break in the weather. More than 400,000 hectares of crops have been affected, according to the Office of State Flood Control and Drought Relief Headquarters. Rainfall in the two provinces has been at 10% of normal levels, threatening tobacco, corn and rice crops. Separately, disaster relief authorities in Guizhou say that more than 5.5 million people have been affected by drought, rainstorms and hailstorms that have caused direct economic losses of 1.8 billion yuan ($283 million) so far this year. The picture above of an almost dried out reservoir in Weining County in Guizhou is dated May 20. Meanwhile, three people died when torrential rain hit Chongqing, and more than 5,000 people had to be relocated after a heavy rainstorm hit parts of Hunan. In Nanning, capital of Guangxi, nearly 900 people were evacuated after a road next to which a school had been drilling for drinking water subsided, causing one building to collapse and six more to tilt. The persistent drought that has hit 13 provinces in southwest and central China is starting to have an adverse impact on farming, China’s drought-relief officials have indicated for the first time. The fear is that the spring planting on 4 million hectares of crop land is threatened by the shortage of water. Reservoirs, such as the one in the picture above, in Shilin County, Yunnan, have dried up, worsening China’s structural water shortages. Approaching 8 million people and 4.6 million head of livestock are short of drinking water, officials say, with the latest number suggesting the impact of the lack of rain is spreading with the drought now in its third year in some parts. Yunnan, Sichuan, Hebei, Shanxi and Gansu are worse affected. A widespread emergency relief effort is underway. Footnote: The main cash crops in Yunnan, where the drought is most intense, are rice, maize and wheat. The province is also known for its tobacco and tea. When this Bystander last checked on Poyang Lake, China’s largest freshwater lake, in September it was recovering from the severe spring drought that had shrunk it to 400 sq. kms, barely a third of its average size over the past decade. That replenishment has not only stopped. It has been dramatically reversed, as the picture above, published earlier this week by state media and reportedly taken on Tuesday, and the one below, taken in November, show. Jiangxi’s provincial hydrographic bureau says the lake’s surface area is now less than 188 sq. kms, about 5% of its former size. At full capacity, it is as large as 4,500 sq. kms, or more than six times the size of Singapore. The lake is fed by five rivers in Jiangxi and empties into the Yangtze. Its water level has fallen so far that fishing is possible for barely three months of the year. The lake used to provide a livelihood for a fleet of 10,00 fishing boats, as well as being home to a rare finless porpoise. It also supports hundreds of thousands of migratory birds including the Siberian crane in winter, that, like the fishermen, depend on a lake full of fish to survive. The lake’s nature reserve authority is planning to stock the lake again to help both groups, though last year’s restocking failed as so many of the fry perished for lack of water. In November, the birds had to have food brought in. 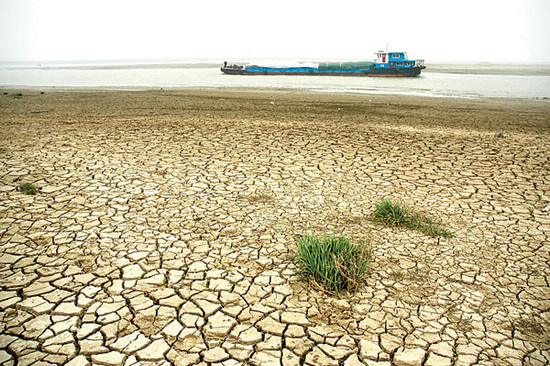 Lack of rain this year is being blamed for Poyang’s shrivelling, but it is far from the only lake in China to be drying up. Nor is drought the sole reason.